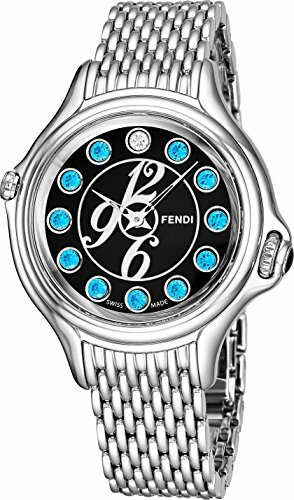 Fendi Crazy Carats Ladies Stainless Steel Luxury Watch - 38mm Black Face Multi Color Gemstones Analog Swiss Quartz Watch For Women F105031000T04 by Fendi at SCRHI. MPN: F105031000T04. Hurry! Limited time offer. Offer valid only while supplies last. FENDI'S REMARKABLE HISTORYThe journey of Fendi began over ninety years ago in a family-run shop on Via del Plebiscito, in the heart of Rome, Italy. If you have any questions about this product by Fendi, contact us by completing and submitting the form below. If you are looking for a specif part number, please include it with your message.